Hey, when you get to 29 it starts to seem like something you could really do for a while. Then you fall down. Unicycling daily has its rewards I guess. 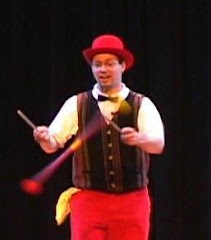 22 moves, new tiny personal record, and now juggling while hovering doesn't seem impossible. I need to get out there and unicycle more. Still, made a little progress today. Yesterday I rode the uni and juggled in the Milwood Neighborhood 4th of July Parade. Introduced some kids to the wonders of plate spinning. They had an orchestra this year -- a bunch of winds and a drummer. Nice stuff.